Politician, loyal citizen and media. What about medias who publish something that can be perceived as something negative or even possibly wrong? Is it possible to trust a politician whose story about the country he/she lives in gives us a negative picture about that country? There are many questions about moral in all societies. What is wrong and what is right? How can we do our best for the whole society? What about medias who publish something that can be perceived as something negative or even possibly wrong? That is something that should be analyzed. There are sensitive situations and therefore medias should be careful. They also should not be proud of this kind of content in their publications. Simply by chance we found an interesting article in Oslobodjenje. It is one of the biggest newspapers in Bosnia and Herzegovina. 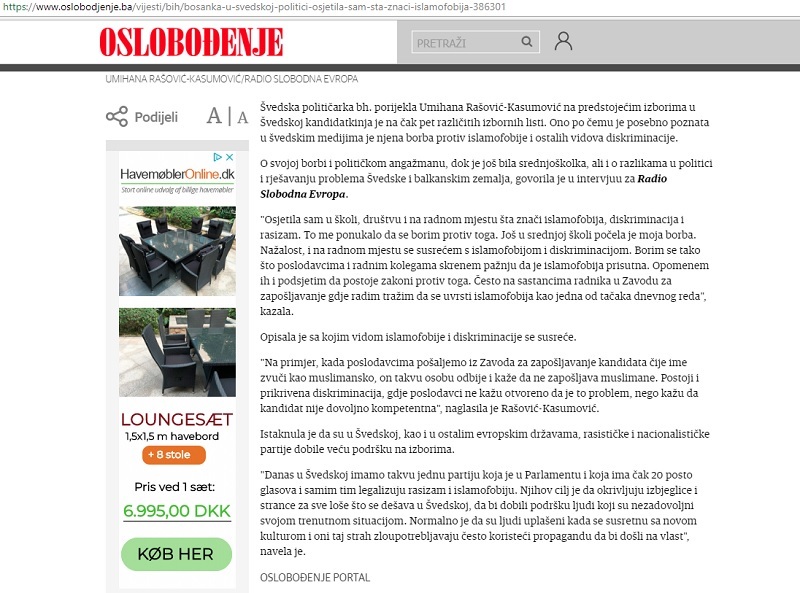 After reading the article more than one time we experienced that Oslobodjenje seems to be very proud in this case. They are proud of the content in this article. From our point of view there is nothing to be proud of. Lets take someone who originally is from one country but works and lives in another country as an example. If that person spreads negative stories about the country where he/she lives and works, then it might be a question about loyalty. In this article from Oslobodjenje we can see a person who originally is from Bosnia and Herzegovina and works and lives in Sweden. Politician, loyal citizen and media. Is it possible to trust a politician whose story about the country he/she lives in gives us a negative picture about that country? In an interview mentioned in the article we can see that she is not so positive about Sweden and the life there. Because of that it is easy to get a negative picture of Sweden when reading that article. She is an active politician in Sweden and therefore the article is nothing to be proud of. Is it possible to trust a politician whose story about the country he/she lives in gives us a negative picture about that country? It is up to you what to answer in this case.